We are a prominent Sodium Sulphide Red Flakes Supplier. 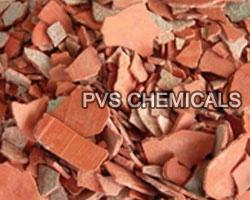 The Red Sodium Sulphide Flakes provided by us are manufactured with the aid of excellent quality chemicals. We are capable of meeting even the large requirements of Sodium Sulphide Red Flakes of customers with ease. We are situated in Kadapa (Andhra Pradesh) and are known as very reliable. We deliver the customersâ�� order on time. We pack the products well and ensure the quality does not get deteriorated during the transit. Our product has huge demand in various industries such as wood processing units, leather tanneries, pharmaceutical manufacturing units etc.